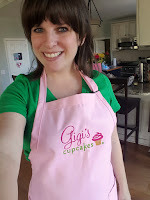 Home/Blog, Cupcakes, personal, wahmlife/Life is sweet! Around this time in 2009, I was getting serious with my now-husband, and I made a really big, bold leap considering our new-ish relationship: I moved across the state to be with him after being laid off from my office job in Memphis. Shortly after my move, I realized that there was a bakery in Nashville that sold only cupcakes. Maybe you have to know me to understand – I love cupcakes. 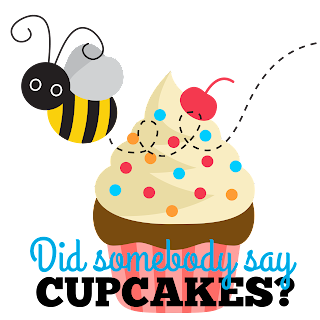 I have cupcake jewelry, cupcake tote bags and backpacks, and cupcake kitchenware. I love making cupcakes, looking at cupcakes, and of course eating cupcakes. “Take me to this bakery,” I instructed my guy. But it wasn’t enough to just visit the bakery. I needed to write a letter to get this business owner’s attention. And I didn’t want to just purchase a cupcake; I wanted to work for her. So I found out her name, took out a pad of paper and my best pens, and I doodled and wrote all over a couple of pieces of paper about how much I wanted to make cupcakes for a living, just like her. Shortly thereafter, Gina Butler (Gigi) contacted me and asked if I’d like to come by the shop to chat. And even though I’m passionate about cupcakes, the drive from our current residence to downtown Nashville was just not practical. But the conversation – which may have been ten minutes, tops – was engraved in my mind immediately. 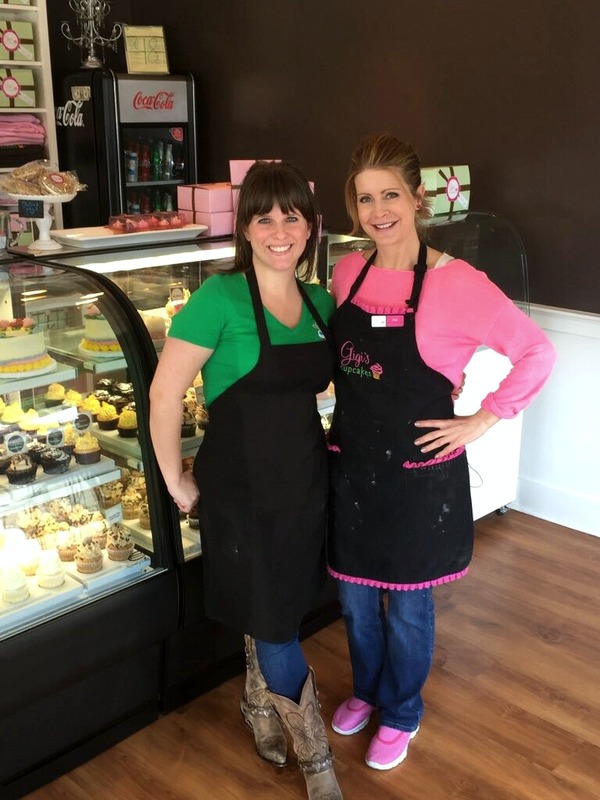 Gina Butler started her downtown Nashville cupcake shop on a wing and a prayer. She had moved to Nashville to sing, and after waiting tables and singing until late into the night for a while, Gina was encouraged by a loved one to open her own cupcake shop in Nashville, using treasured family recipes and a lot of credit. (You can read Gina’s full story here.) I listened intently to her tales of serial entrepreneurship and risk and I was really impressed; what I didn’t realize that day was how much my journey in Nashville would mirror hers. With no job and no college degree, it was hard for me to find work here. When David suggested that I clean houses, I balked several times, instead taking a couple of dead-end low-paying jobs, one after the other. And in between each job that I quit, David would again suggest cleaning houses. Finally, I relented and he purchased my first business cards and a big bucket full of supplies for me to begin my own business. Over the next two years, I made more money in some days than I’d made in a week at an office job. I wasn’t particularly crazy about scrubbing toilets, but cashing my own checks, going to college while I worked full-time, and making my own schedule? Yeah, that was my jam. My journey in entrepreneurship had begun, and I was never looking back. When I became pregnant with Benjamin in 2011, I was still cleaning houses and also working at JoAnn “for fun.” Soon, though, debilitating fatigue and nausea made it all but impossible for me to continue my physical marathons every day of cleaning a large house for four hours, then working an eight-hour shift in retail. With David’s support, I quit both jobs and began nesting to prepare for our first baby at around thirty-seven weeks pregnant. I began doodling on the plain glass ornaments from Hobby Lobby in my newfound spare time, and decided to list a few on Etsy to make some extra money, and most of you know the rest from there. That’s where the artist met the entrepreneur, and the results over the past four years have been rad. From my bag of goodies..
On Christmas Day of last year, I found out that I won a contest on Facebook to have lunch with Gina Butler, and to say I was thrilled was an understatement. Due to a glitch in Facebook’s message delivery, I missed a message and thought I’d missed out on my winnings, but not so! Gina’s awesome Franchising Manager, Brad, kept in touch with me to make sure I received my prize. Today was the day that I attended lunch with Gina and some of her employees, and was it ever worth the wait! I reminded her of the day that we first met – a day that she had no way of knowing would be so important to me. I was treated to a delicious lunch and playing eavesdropper to some of their conversations about the cupcake business. After lunch, we walked back over to the shop where I got cupcake-frosting lessons from – guess who? – Gigi herself. The pressure of frosting a cupcake without wasting a drop of her delicious homemade frosting was high, but I did it! And I got to take a few home for myself. Actually, Ms. Butler sent me home with two bags full of goodies from her shop, including an adorable apron! Needless to say, today was off-the-charts awesome. So it took me a little longer to talk about my lunch than I’d intended, but I wanted to go into the whole back story about why this was such a cool experience for me. And what makes it even more wonderful is knowing that now, with my embroidery workbook headed toward publishing, I get to be the one who is reaching out, locking hands with other women, pulling each other along on our creative journeys. I have friends who are talented in many areas – photography, sewing, graphic design, cooking, and more. We barter with, rant to, and confide in one another. Talented in many different ways, we are all on the same path.. I have truly come full circle from being inspired to inspiring others. 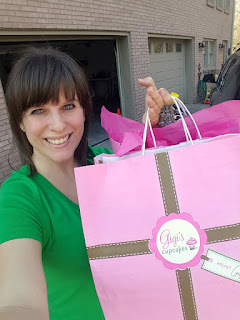 If you have a Gigi’s in your town, stop by for an awesome cupcake, and know that you’re supporting this talented entrepreneur! Have a sweet weekend, stitching bees! !